In a recent study of how millennials and the rising generation seek out meaning, it may surprise you to learn what is displacing organized religion in their lives. “How We Gather,” a study by Angie Thurston and Casper ter Kuile, researchers at Harvard Divinity School, found the most striking places they seek and find meaning is in fitness classes such as CrossFit and SoulCycle. This space provides for them many aspects that one would HOPE to find in organized religion, such as community and a space for growth and vulnerability—all of which are key components of spirituality. In an age where young adults are picking and choosing their religious traditions, this type of space gives them much of what they are seeking in their spiritual journey. This school of thought adds to the rising generation’s mantra of being spiritual but not religious. Perhaps this phrase is a bit tired now, but as you can see, the path being blazed is as fresh as cut hay in the spring. Leaders from traditional faiths may find the idea of entering a cafeteria line to pick and choose from the traditions offered is akin to blasphemy. However, to the heart of the rising generation, it is a pathway to meaning that is not hindered by past traditions that they don’t understand or embrace. 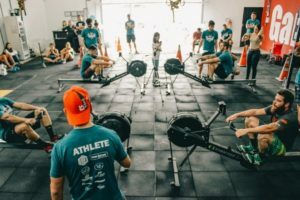 When a person feels judged in their path or are guilted for turning their backs on traditions they don’t accept, then their search for meaning expands to wherever they can find community—such as the CrossFit gym. There, they can train as individuals or join a team with a mutual goal. Bonding comes from experiencing hardships together. A co-author of the study made the comment that there are a growing number of people who don’t fit into a religious box. If you pray to Jesus (they say), you can do that on a bike. The CrossFit experience allows the participant the freedom to integrate and select what they want to do. Theology isn’t pushed into your face—-they say. They form personal friendships with the group leaders or other patrons which lead to vulnerability. The group leaders take on “pastoral” roles and soon they are texting highly sensitive and personal information—together they find community and understanding. While in the exercise experience, they form a tribe or pack and support each other in their goals—even clapping for each other as they cross the finish line. This all becomes a new sense of ritual and forms a new type of religious tradition. It is interesting to me, this new spiritual and religious space some of our young people have drifted toward and now embrace. I applaud the independence of youth in discovering their spiritual and religious path. I believe that wherever they find it, it will create for them a higher sense of meaning in their lives. However, when looking at this through the eyes of faith, there will never be a substitute or replacement for the peace that God brings. If some of these new venues create a space for faith, I hope it is the beginning of what can be joyful peace, and not just a transitory peace that changes from fad to fad. Along this concept of “adding to” and not taking away from their chosen venue for peace or spirituality, I also hope they will find the time to explore without judgment, whatever meaningful faith traditions that gave their parents or ancestors peace and hope. I once visited my grandfather’s place of worship in the community he lived in. There in the little town of Malans Switzerland, was a beautiful little church with a cemetery in the back. I saw my namesakes on the headstones. 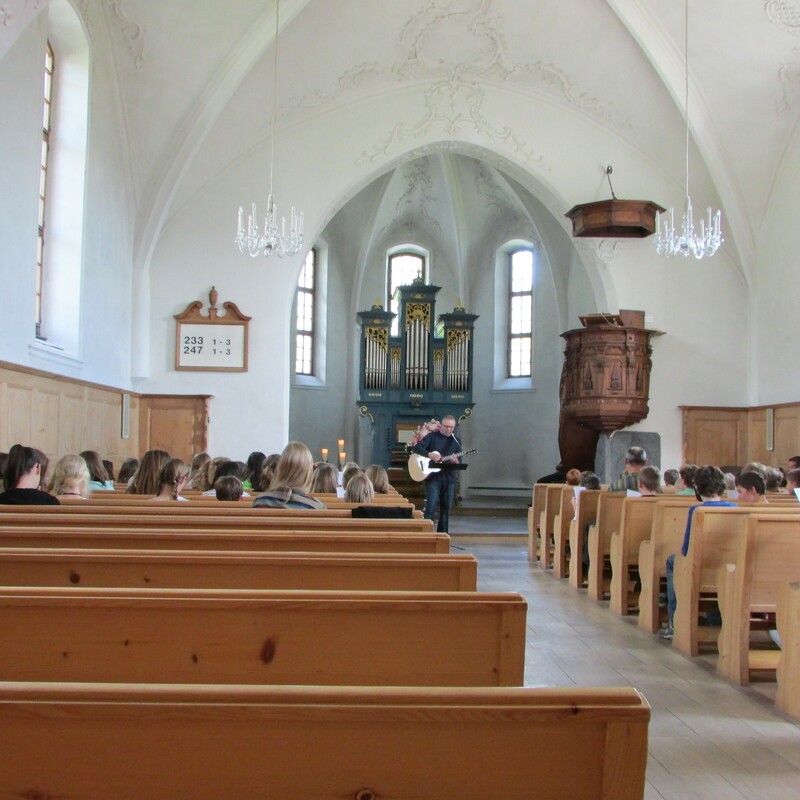 I slipped inside the chapel in the back and sat on a pew and listened to a teacher playing the guitar and singing to the children in a class. It was a spiritual moment for me as I sat with gratitude and pondered the space of faith my grandfather embraced which moved him forward in years of great despair. He found hope on the pew I sat on perhaps and his community gathered around him to buoy him up. I do believe that you can find spiritual sustenance outside of churches and that new traditions can be established that bring great meaning to life. You can pray to your God on a bike, in a church, or in a car. My question is, why is this a sucker’s choice (either the CrossFit gym or a Church or religious tradition)? Why can’t it include “all of the above,” where without judging, we can all experience a space of faith that doesn’t exclude, but rather, includes all that the inner-soul yearns and reaches toward. Instead of cafeteria spirituality, let’s all come to the smorgasbord and feast. Let’s not limit ourselves in our quest for developing our faith, spirituality, or religious traditions. Let’s be part of a big-tent mentality and not live our lives in a pup tent. I embrace all the goodness that CrossFit and like fitness trends have to offer—-as long as it doesn’t exclude all the good that faith tradition adds to the process of having a holistic life. I discuss a holistic life for the rising generation, a life that includes spirituality and religious practice, in my book Launching Leaders: An Empowering Journey for a New Generation.